Claude Monet’s painting of Spring at Giverny (1886) is a vision of the village clothed in the softest pinks. It is a first, and most lasting impression of a region full of magic light and charm the country that seduced and held him captive for the rest of his natural life. Claude Monet (1840 – 1926) celebrated the real art of gardening in the creation of his now world famous garden at Giverny, in Normandy. Just like we do today Monet subscribed to all the gardening magazines and nursery catalogues. He went to flower shows, visited other gardens, swapped plants with his friends while nurseryman and editor Georges Truffaut supplied him with many of the plants he needed. 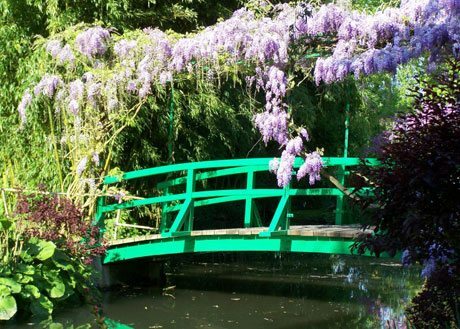 Today the garden is a great draw card in the north of France, a sea of fresh green dotted with the pale pink foam of cherry blossom and mauve mist of wisteria in the spring and summer. Monet had a comprehensive botanical library and throughout his life remained faithful to the stalwarts of French gardens. Beautiful hybrid tea roses, delicious dahlias, gorgeous gladioli and generous geraniums. 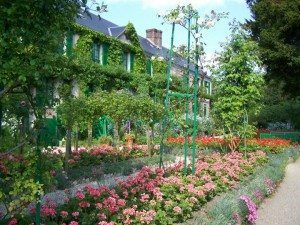 In this glorious place Monet wove all the threads of his creative life together to became part of the fabric of his garden. 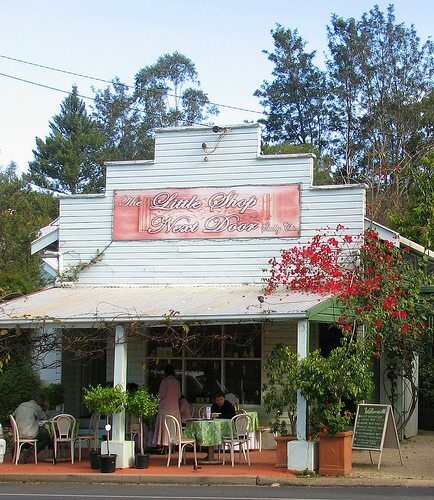 His view and tastes expanded to include rare collections of orchids and water lilies. The garden was always imaginative and unique. It was conceived and planted in the spirit and ethos of an Impressionist painter. 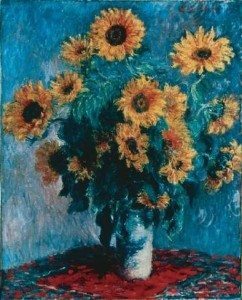 The flowers he was said to have loved best were poppies, sunflowers, nasturtiums, asters, Christmas roses and jonquils. 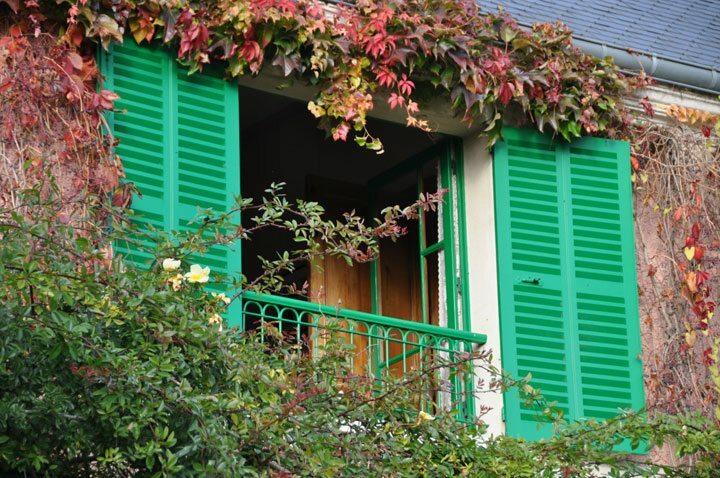 He never tired of painting them and they are still growing at Giverny today. Monet would sometimes go for long periods without painting spending his days walking, working and contemplating the garden. Blessed with an iron constitution and vast reserves of energy, he traversed the garden mentally improving it. As it, and he gained in fame and journalists, art critics and dealers arrived to see it and talk to him about it. He would receive them in his own understated sartorial style. Too poor to continue living at Paris, he rented the house when he was 43 years old and died there 43 years later. Sunlight, fresh air and the interplay of light reflected on his canvases where none had shone before. They were all now essential elements of his art work and individual expression gained spontaneity and sensuality in a style that previously had only known sobriety. 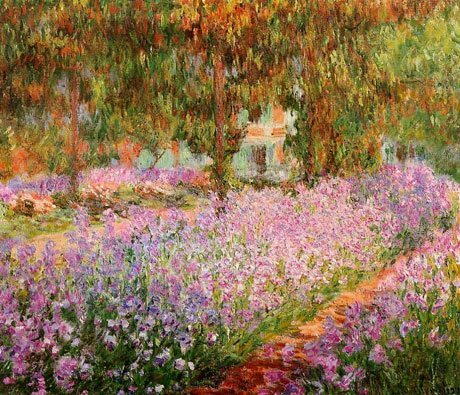 Monet always claimed that the ‘poor palettes’ of the painter would not be able to capture the real colour of flowers. He loved purple and yellow, red and yellow, yellow and orange, purple and white with pale blue forget me not’s, which were a favourite. He visited Holland to paint the Dutch bulb fields. He gleaned from that experience the idea of a garden as blocks of colour surrounding a house. ‘Nature never stops’, was a favorite saying. With broad brush strokes artist Claude Monet closed the gap between the dreamer and a dream. He compared his own work to monks illuminating manuscripts. It was all about a close union of solitude and silence he told a reporter. ‘If you absolutely must find an affiliation for me, select the Japanese of olden times; their rarified taste, their aesthetic…that evokes a presence by means of a shadow, and the whole by means of a fragment’. He admired the bricklayer who, when building a wall for him, placed a rose in front of him so he could, from time to time inhale its scent as he worked. His wall progressed and he was always moving the rose so that it remained before him. “The subject is secondary for me”, he said, “what I want to reproduce is that which is in between the subject and me”. An Impressionist painter working on a canvas took into account colour, texture, variety, balance, composition, shading and perspective. These same concerns motivate the garden designer. Painterly concerns and techniques transfer well from the art of painting to the art of gardens. His flower garden was a celebration and from his bedroom window across to the Grand Allée he could see his garden in all seasons and weather conditions. A large single rose “Mermaid” reputed to be Monet’s favourite climbed the wall outside his bedroom window. Busy planting vegetables so the family could eat, Monet said “My salon is the barn. All of us worked in the garden. I dug, planted weeded and hoed myself; in the evening the children watered. As my financial situation improved I expanded, until one day I was able to cross the road and start the water garden. The water garden became a garden of perspective and of the unexpected. It had an affinity with seventeenth century Japanese gardens with their lakes, winding paths and points of contemplation. It was a ‘dreamlike setting’…and ‘extremely oriental”. He enhanced the Japanese atmosphere by planting a collection of bamboos, acers, Japanese tree peonies with large single flowers of red, dark red, pink and white, weeping willows and every known variety of water lily. He framed the pond with a narrow border of grass, softening the edges and used indigenous plants from the marshes and aquatic plants obtained from a specialist near Lyon. 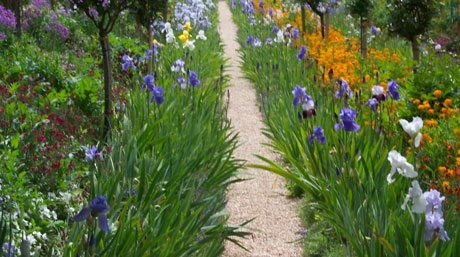 Where the flower garden had straight lines, the water garden was curvaceous with arches over paths and circular flower beds. In them he grew Japanese tree peonies. Monet always loved the water and he often painted from his boat. He lived all his life on one great river that at the time was so unpolluted and clear that you could see the fish nibbling and the reflections of the trailing clouds of smoke of the little steam powered cargo boats that traversed it. Having struggled his whole life to capture atmosphere in his art work he now challenged himself to capture atmosphere filtered through water. His close circle of friends who visited him at Giverny were all fellow garden enthusiasts. They all talked politics, literature and philosophy alongside the cuttings, the compost and garden marvels such as the water lilies. 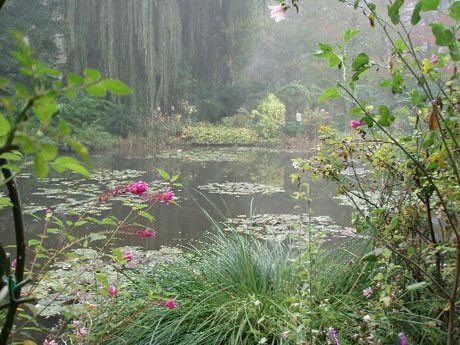 Monet’s passion for his water garden never abated and as his fame as an artist grew so did his gardening team. His exhibition with Rodin in 1889 brought plenty of prosperity. 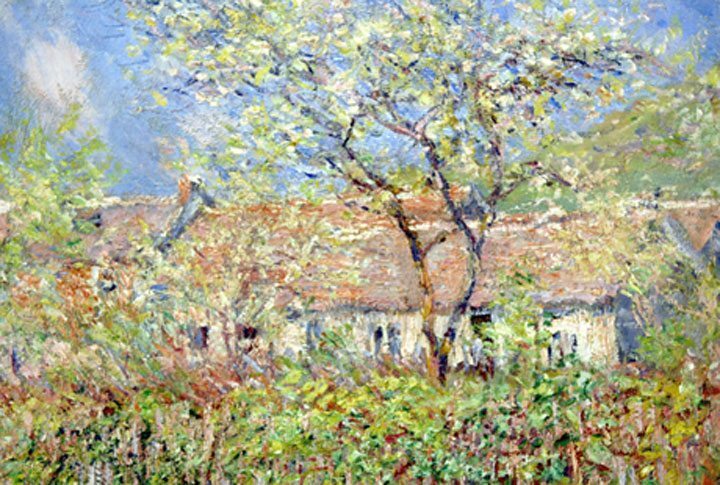 It enabled Monet to finally buy his home, which he commemorated by building two greenhouses, hiring six gardeners and getting married again. His flower garden was the yin and his water garden the yang. He was a painter and his garden was conceived, planted and infused with the spirit and ethos of the Impressionist painters. Perhaps more than any other art movement Impressionism explored new ways of interpreting the world. Individual expression, spontaneity and a celebration of nature were essential and Monet brought a new sensuality and brilliance to his colour palettes. Light, he realized, transformed everything. 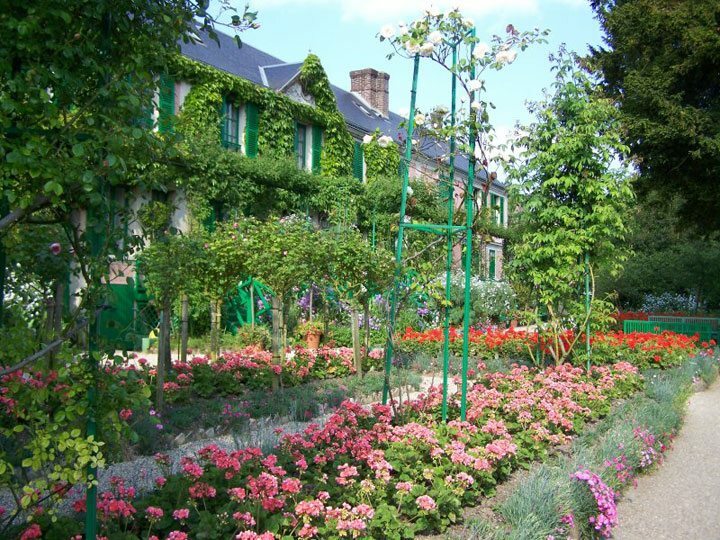 The drama of light, the depths of its dimension, the boldness of his composition and the exquisite gradations of colour he preferred all infused his painting and plantings at Giverny. 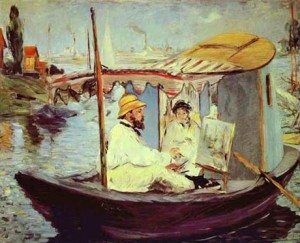 Claude Monet left us with a lasting impression of the beauty of creation that together with a sense his creative genius and imagination, as well as his hand was perhaps guided by the creator. Wonderful article on Monet’s art and gardens. I know this subject well having spent over 25 years on it! I went to help restore Monet’s gardens in 1985 and return annually to photograph them. This is a place I know and love. The all new 2oth anniversary edition of my book Monet’s Passion Ideas, inspiration and insights from the painter’s gardens is a work of love with more history, photos of the garden today in all seasons and design ideas to bring home.